The venerable DS200 Substrobe now has the newest IC chips and IGBT circuitry allowing this ultra wide and ultra powerful strobe to be compatible with current digital cameras and any TTL circuitry included in our housings. State-of-the-art electronics provide a blazing 200 watt seconds of power recycling in an incredible 1.6 seconds. 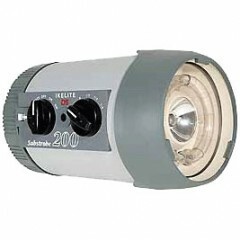 This is a high performance professional strobe with the original features that revolutionized underwater photography. Mount the DS200 on either side of the camera and the control panel and ready light are always visible for quick confirmation and easy access. The DS200 offers four manual power modes or can accommodate an optional #4100.6 EV Manual Controller. The DS200 SubStrobe delivers an even ultra wide 100 degree beam. The special "soft-lite" reflector produces softer, warmer, more natural colors. A diffuser is included to widen and soften the light even more. The built-in aiming light is more than just a target light; it is powerful enough to use as a night diving light. The main strobe electronics are sealed from the battery compartment, and the industrial grade NiMH battery module is easily removed. No more guessing about when to recharge; the DS200 features an LED gauge which shows the remaining battery power. The battery door is easy to disassemble and clean. A switch lock is included to prevent accidental turning on of the strobe.